The plan of the website is straightforward. The images must speak for themselves. They introduce a possibility to interpret the history of ancient Egypt and to consider the evidence of canonical image making, as well as that of a system, namely of the matrix on which the Masterplan of the total Pyramid field was based. 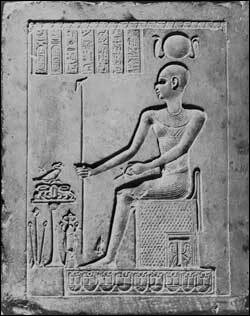 It marks the integration of early Egyptian astronomy, geometry, planned architecture, art and writing. After many years of investigation, I (re)discovered the true motive behind the overall plan of the Pyramid field of ancient Egypt. The result is the baffling correlation between the nocturnal sky and the Pyramid field. The plan of the Pyramid field equals a part of the star map on earth, as it presents an exact model of the Constellation of Horus. The Masterplan consists of twelve Pyramids, a Pyramid city and three temple cities (Memphis, Letopolis and Heliopolis), built during the reign of the third, fourth and fifth Dynasties. The whole plan correlates with sixteen stars. See Subpage 2: Technical Explanation. For an insight into the reasons why the Pyramids of the sixth and twelfth Dynasties were built, see also Subpage 2: Technical Explanation. Thus, the enigma of the words of Hermes Trismegistus (Thoth) to Asclepius (Imhotep) has been solved and their meaning is clear. The Masterplan of the Pyramid field was created after the iconographical image of the famous pose of Horus, which, in turn, was based upon the “main outline” of Orion. That image is momentarily known as “smiting the enemy”, yet in my opinion it is the emblem of the worldly power of ancient Egypt. In the course of some 4,000 years, the pose of Horus spread from Egypt to Mesopotamia and Persia, to the Hittites, Assyria, Carthage, Rome, and to Meroë. The intention of my work is to deliver a contribution to a better understanding and further development of insight into the astronomical religion of ancient Egypt.